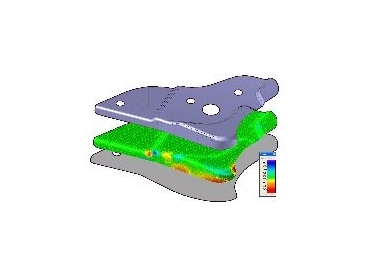 Sheet metal forming process simulation. TOPSOLID'Progress is a computer-aided-design (CAD) solution for the design of progressive tools for sheet metal forming. Since 2004, Missler Software has worked closely with AutoForm Engineering, specialist in the die face design and sheet metal forming process simulation software notably for the automobile industry, to create unfolding techniques which are directly accessible in TopSolid. The first stage of this collaboration was completed with the creation of the module BlankWizard in January 2005. The second stage happened with the launch of TopSolid'Progress 2006 and the creation of the new module FormingWizard. Let's take a closer look at TopSolid'Progress, BlankWizard, and FormingWizard. In addition to incorporating all those functions standard to TopSolid, TopSolid'Progress enables the successful blank determination of a sheet metal part and the design of the strip layout in half the time needed by a standard CAD software. The software manages all cutting, folding and deforming stages of the sheet metal, creation of the die set, addition of standard components together with their machining processes, creation of punches, non-standard matrices and draft creation. BlankWizard, a module available with TopSolid'Progress since the beginning of 2005, integrates AutoForm Engineering's forming simulation technology to enable the die designer to rapidly define the required blank and design the strip in a completely associative process. BlankWizard is also available for purchase directly with the module TopSolid'Design. Companies working with TopSolid'Design will use BlankWizard to obtain the cutting contours of parts which cannot be folded/unstamped using "classical" methods. This module is also very useful for calculating the surface of the part and thereby calculating the amount of material needed at the estimate stage, in particular for parts created by stamping or progress tool processes. Companies already using TopSolid'Progress can use BlankWizard in many different ways. Its functionalities are directly integrated in the blank creation which is carried out when the part is imported. Many possibilities are open to the operator who can carry out a global unstamping operation or use a method that combines unfolding and unstamping (for some isolated areas of the part). The collaboration between Missler Software and AutoForm Engineering continues to evolve and earlier this year Missler Software, represented by CIM Solutions , launched FormingWizard, a more advanced follow-on from BlankWizard. This new add-on has been created for companies that need more precise information on the process of unfolding that will be carried out on the part. Firstly FormingWizard gives access to a database of standard materials to calculate more precisely the dimensions of the unfolded part. The operator can add his own materials to the database by indicating the mechanical characteristics of the material. Secondly, FormingWizard offers analytical tools which can detect, both globally and locally, the variation of the thickness levels and deformation undergone by the part. The operator, thereby, obtains precious information to analyse the feasibility of the part deformation.